The rapid growth of interest and research activity in ion channels is indicative of their fundamental importance in the maintenance of the living state. This volume was prepared with a view toward providing a sampling of the range of molecular and physical methods that are significant for the study of ion channels. 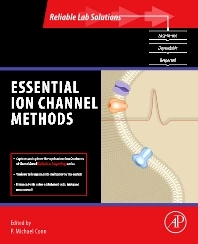 As part of the Reliable Lab Solutions series, Essential Ion Channel Methods brings together chapters from volumes 293 and 294 of Methods in Enzymology. The chapters have been selected by the editor and updated, when possible, by their original authors to include new research and references. The result is a set of chapters which make use of graphics, comparisons to other methods, and provide tricks and approaches that make it possible to adapt methods to other systems. Methods are presented in a fashion that allows their replication by individuals new to the field, yet providing valuable information for seasoned investigators.